Nerds In Love: Another EVA! A few weeks ago I wrote about Pumplemas, the failure of the External Thermal Control System pump that caused a few spacewalks (EVA= Extravehicular Activity, or as I like to call it "stepping outside") in order to replace the broken pump. Since then, US-airlock based spacewalks have been pretty rare. (There is also a Russian airlock from which Russian crew-members conduct spacewalks.) US EVAs used to be done routinely during space shuttle flights, with each flight having 3-4 spacewalks planned, often to assemble some part of the ISS. For those, the crew trained on the specific task for many months in the pool before trying it out on the real vehicle. Stage EVAs, which are EVAs without a shuttle docked, are more rare and usually more complicated. Like with the pump, they are often done to respond to a failure, rather than to accomplish assembly tasks. Also, station crews have rarely been trained on the exact task, and if so it was many many months previously. Today will be US Stage EVA 18. The primary task is to replace a broken power box called MBSU 1. A Main Bus Switching Unit (MBSU) is like a giant space circuit breaker. It contains 14 switches that allow it to route power from 2 power channels down to several downstream loads. If any of those switches senses an overdraw of current then, like the circuit breaker in your house, it will trip the switch open to disconnect the power. 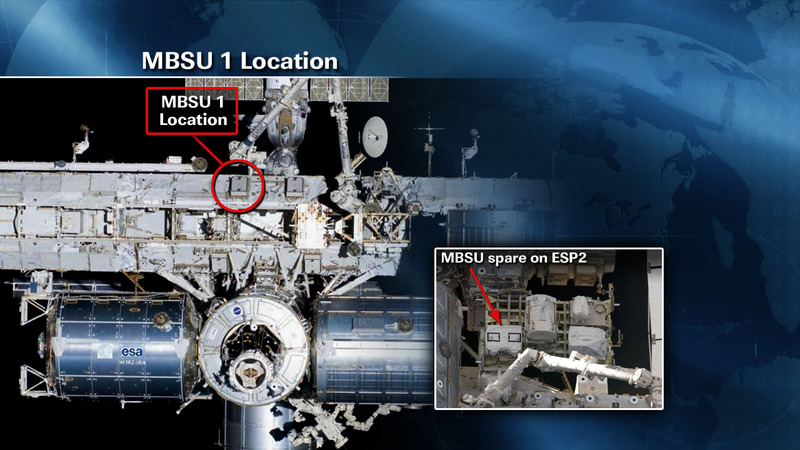 As there are 8 power channels, there are 4 MBSUs, each responsible for feeding roughly a quarter of the total loads on the space station. Here's more on the EPS Architecture and the MBSU's place in it. Last year it developed some corrupted firmware and eventually stopped communicating. It was providing power just fine, but we can't command to it or get telemetry from it. I was actually on console (in the middle of the night) the day it decided to quit talking for good! To replace it, we have to turn it off, which makes this EVA a little tricky- we have to do it without a quarter of the space station power. MBSU 1 powers several core loads, such as life support, computers for station control, and cooling. Over the last two days, the ground and crew worked together to install two power jumpers. Think of it like a big extension cord that you use to power your television with the outlet across the room. In this case we have rerouted the core loads to be powered off of other MBSUs so we can remove MBSU 1. This at least allows us to keep all the important things on, but there is still a cost... being down a quarter of the total power on the space station still requires major powerdowns of less critical equipment. It's gonna be pretty exciting, and I am looking forward to talking to MBSU 1 again. (I've had a bit of a complex since it gave me the silent treatment a year ago!) You can watch the EVA live on NASA TV and learn more about it on NASA's website. EVAs haven't just been "pretty rare"... there hasn't been a US EVA since the three back to back EVAs to fix the pump module in 2010! Nah, that's just Stage EVAs. Shuttle docked EVAs happened all the way through last summer, STS 134/ULF6. Ya, I guess that's what I meant. We've had no stage EVAs. There have been 7 other EVAs all during the last 3 shuttle missions.